During "The Eve of Sustainability - Lifestyles of Health and Sustainability Leadership Gathering," I heard many presentations. From Vail Resorts, Ingeo, Haberman, Mohawk Greenworks, Amala, Mini, BBMG and hessnatur. I then had conversations. 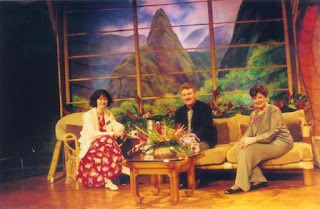 With Susan Benarcik design and others. The presentations and conversations had me thinking. About storytelling. About sustainability. About the meaning of green. Consistently, I heard that consumers crave authenticity and relevance, stories that connect with their lives, and meaningful simplicity so they can truly make decisions that generate a positive difference for their environment. They particularly crave simplicity. Not too dissimilar from my need to be practical and cut through bling and distractions to get to and focus on what is truly meaningful... to simplify while not wasting precious resources. Shortly thereafter, while catching up on some reading, I came across articles that referred to this same and very real consumer zeitgeist. Iconowatch,on April 14, 2009, states "SAY HELLO TO SIMPLICITY." Have you read it? I love the final call to action: "To start, offer the consumer an escape - mentally, emotionally, physically, visually - from the disorder of the economic downturn." I particularly enjoyed Greg Sieck's post about Brand Relevancy in the Age of Frugality where he directs you to a terrific white paper on the subject. Read it. Here's why. 1. The changes affecting us have to do with "practicality, frugality and the will to survive." 2. Consumers are looking for the simpler life. 3. Brands winning with consumers offer value that resonates with consumers: superior knowledge, remarkable service, memorable experience. 4. "Your presence online ... makes you part of the conversation and accessible to your customers." MediaPost published Earth Day In A New Era on 4/23/09. I enjoyed the description of changing consumer purchase behaviors. It matches what I see and feel taking place around me. Do you see the same? Especially since BBMG referred to the 2009 BBMG Conscious Consumer Report which explains that "Green is up. Trust is down." Lack of trust doesn't mean disinterest. Rather it indicates a desire to learn more and research more. Simplifying sounds better and better to me. Does it to you? P.S. : Thank you to my friend Jenny Cross from Mohawk who now heads up Greenworks and invited me to attend this marvelous event. Contrasted Tools originally uploaded by beautyinmetal. I appreciate easy to use, practical work tools that make me more efficient. I bet you do, too. I have three to share with you -- two newly discovered ones and another that I've started using regularly for business. The first is a web collaboration tool called Yugma for desktop sharing and online meetings. It comes in three flavors: Free, Pro and Skype Edition. I've been using web collaboration tools for many years. The clunkiest was NetMeeting. The most elegant was the latest version of Centra -- originally deployed at Solutia when we converted over to SAP -- which I was delighted to Beta test for sales and marketing purposes. Thanks to Centra, I conducted training sessions with our Wear-Dated Representatives and online presentations with customers. It was an ideal tool for resolving application issues, brainstorming online and collaborating on projects. No surprise, identifying an acceptable alternative was priority number one... And Yugma has been absolutely fantastic! It's easy to use and easy for viewers to join online meetings. In fact, so far, I've had fewer issues getting others set up than with many of the other applications. The free version is robust and the Pro version even nicer with extra features [e.g., advance scheduling of sessions, white board tools, etc.]. I suggest you check it out. The next tool, although not new, has taken on new meaning for me. Skype. Do you use it? 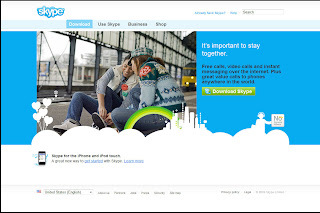 Skype enables person to person conversations via your computer. For free. It's also the most cost effective way to call landlines or cell phones long distance and internationally that I'm aware of. 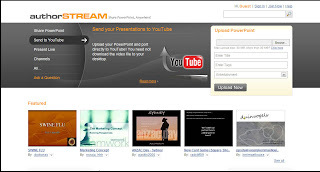 The last tool I share with you is authorSTREAM for sharing PowerPoint presentations online. Think SlideShare, without the problems. That's right. I can't get SlideShare to fully load my presentations [see ExecuNet Presentation: Social Media Primer]. And, I haven't yet gotten resolution. So, go ahead. Try my practical work tools, and let me know what you think. And let me know, too, if there others I should explore. In case you weren't aware "Blogs are now mainstream media." The quote appears in eMarketer's Blogging Has Come a Long Way, Baby from 4/22/2009 and comes from the CEO of Technorati. I absolutely subscribe to it. We all have a choice. We can ignore the conversations taking place or we can learn from and participate in them. In my mind, participating is a no-brainer - especially if the conversations relate to topics we have an interest in. Otherwise, how do we learn from the discussion let alone shape it? + the number of US Blog Readers [currently at 96.6 million, projected to increase to 128.2 million by 2013] - see chart above. In terms of readers, that's close to 60% [up from 48.5%] of the US Internet users within 4 short years. Far from insignificant, making web logs effective and accepted as a means for influencing and monitoring conversations. An LA Times article titled "Ignore Twitter? Major brands learn they'd better respond -- and quick" relates to another tool, Twitter [here's my Practical Twitter Primer]. Read through the examples listed from Amazon, Domino's, Skittles, Hasbro, CNN and Coca-Cola and note how each used social media tools to respond [or not] and take part in discussions affecting them. I'm impressed with Domino's and Coca-Cola. Are you? And are you encouraged yet to explore these various tools so you can determine what works best for you? That's the message I shared on April 17, 2009, when Linsey Levine invited me to share my Social Media Primer presentation to her ExecuNet group in Parsippany, NJ which took place at the offices of Right Management. Whether you actively use these tools to manage a job search, or your personal or corporate brand, here's an opportunity to become aware of them, experiment with them and understand what they mean for you personally and professionally. As I did during Linsey's Westchester ExecuNet session, I shared an overview of social media. However, I added marketplace information that Mack Collier included in his MarketingProfs web presentation titled "Not Blogging Yet?" As with the eMarketer data above, it puts all of these social media tools into business perspective. And, yes, there is a learning curve. And you may feel overwhelmed with all of the information available. But, eventually all of the pieces come together and you realize that this new social world is not only relevant and valuable, but it is also intellectually stimulating, and an effective medium for influencing conversations that matter to you. Note: Linsey shared Technology Tools for Job Seekers part 1 and part 2 from the Career Goddess. Although geared toward job searching, many of these tools are equally effective for business, brand or research purposes. I just came across this article Twitter Talk by Stephanie Azzarone which specifically discusses how to use Twitter to market to moms. I particularly like the basic lessons that the author recommends. Worth reading and thinking about. As a practical marketer, I admire approaches, thought processes and guides that help to simplify and make sense. 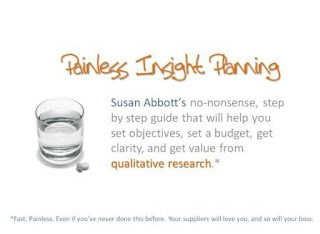 One such that relates to Market Research is Susan Abbott's Painless Insight Planning e-book. I consider Susan Abbott, Abbott Research + Consulting, a fellow practical marketer and kindred spirit. She offers both valuable and actionable advice and her observations always make me think. As a qualitative researcher, she knows how to ask questions, listen and uncover insights. Some of that you'll discover if you check out her Customer Experience Crossroads blog. Also, read the insights she shared with me in Social Media Series: Susan Abbott on Bridging New & Old, my interview series about bridging new marketing and traditional marketing. Painless Insight Planning represents a practical solution to preparing for a market research project. It will help you identify and articulate what your objectives are before you start your project. Susan explains that too often, at the start of a project, clients don't have a clear purpose in mind for research. Unclear objectives mean that the research project won't deliver all of the value that it could. Leading to wasted resources and missed insight opportunities. I could have used this kind of a guide when I started out. I encourage you to download it and put Susan's suggestions and questions to work. And, then, let me know what kinds of insights you uncover from your research. I know Susan will be interested. By the way, Susan profiled Flooring The Consumer, my blog about the retail experience and marketing to women, in a three-part series. The links are listed in Customer Experience Crossroads Profiles Flooring The Consumer. Kinnelon, NJ – Christine B. Whittemore has joined the Floor Covering Institute. Whittemore is the chief simplifier of Simple Marketing Now LLC, a marketing consultancy focused on bridging traditional marketing with new and social marketing, to improve the customer retail experience and build brand. In joining the Floor Covering Institute, Whittemore brings a focus on basic and simple solutions to common marketing problems, in place of the complex and expensive solutions traditional marketing offers. Her comprehensive knowledge of web based solutions to marketing issues and a special familiarity with the consumer retail experience enable her to enhance the Floor Covering Institute’s industry expertise. The Floor Covering Institute, a consulting group founded in 2007 by Jim Gould, is dedicated to providing global consulting services to the floor covering industry. Gould, with 38 years of experience in the flooring industry including regional and national distribution, retail, global sourcing and importing, buying groups and all of the business disciplines they encompass, has gathered within the Floor Covering Institute other experts in their fields. Whittemore joins Gould, Christopher P. Ramey, president and founder of Affluent Insights and chairman of The Luxury Marketing Council Florida, Lewis G. Migliore, president of LGMTCS and Associates, David Wootton, president of The Wootton Group LLC, and Carl Ruland, president of Global Flooring Consulting of Bonn, Germany. Member consultants maintain their independent consulting concerns thereby providing professional assistance to clients through both individual and team based approaches. The Floor Covering Institute, now in its second year, includes clients in North America, Asia, Europe and Australia and provides them with a range of solutions and services. For more information about Simple Marketing Now LLC, contact chief simplifier Whittemore at CBWhittemore@SimpleMarketingNow.com or visit the Simple Marketing Now website [http://SimpleMarketingNow.com] and companion weblog & newsroom – Simple Marketing Blog [http://SimpleMarketingBlog.com]. The global consulting group was founded by Jim Gould in late 2007 to help flooring industry companies solve problems, improve their competitiveness and identify new business opportunities. With clients in North America, Asia, Europe and Australia, the group assists in a wide range of disciplines including manufacturing, distribution, logistics, retail, associations, investment groups, recruiting and expert witness testimony. For more information, visit http://www.floorcoveringinstitute.com. IMG_1688 originally uploaded by catchthevision. What irritates you the most when you visit a website? And how does that affect your willingness to spend time on that site? 1. I hate not finding relevant content - especially after having been enticed via the Google search results. 3. Topping my list, though, are sound effects. First those that can't be turned off - as these two randomly chosen examples demonstrate: Dee's Thai Restaurant, a wonderful neighborhood resource and Big Bob's Flooring Website, a corporate site for a reputable organization with a strong personality. Next are those with sound that I have to manually turn off. Example Digitas, which is tastefully done but still irritating [the images also rotate too rapidly for me]. Sound effects can add a distinct authenticity, as they do in all three examples. 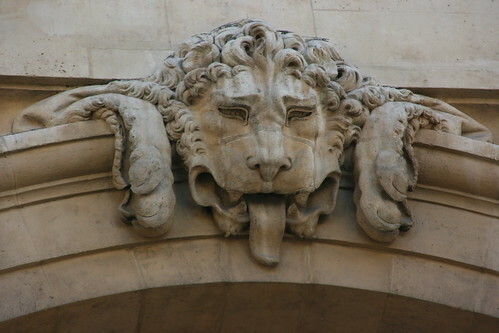 Unfortunately, too often they SHOUT, putting visitors on the defensive, rather than soothe or engage. Now, I bet you spend a great deal of time online, researching, investigating and checking out new resources. I do. I know our customers do, too. So, if you put yourself in the fingertips, eyes, and ears of your customers [i.e., the equivalent of walking in her shoes for the brick & mortar equivalent experience], and experience their search for your product/brand/store, how do you rate? Do you irritate and drive them away, or do you invite, draw them in and engage them for long sessions? It's a critical question. Especially when the majority of our customers start at a search window to gather information relating to a purchase. Do you agree? Is your website heavily flash based, with the majority of your delicious content hidden from those information hungry spiders and robots crawling through your website looking to find just the right digital trail to deliver to a search result page? Do you have enough relevant content on your website? Content that explains and describes what you do, who you are, what you offer? Is your content interesting and well written? Does it answer the questions that visitors want answered? Have you identified the keywords that consumers use to search on your product or location and included those in your website content? Don't forget titles, headers and tags. Have you inaccurately associated keywords with your site so you appear in search results but are totally irrelevant to the original search? And, about my third pet peeve - sound effects... I say ditch the sound effects. If you really can't, then make sure that your default setting is 'off' rather than 'on' and give your visitors the option to listen at their convenience. 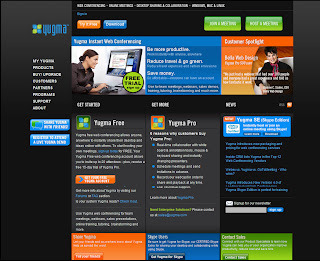 Definitely experience your service/product/offering and website as would your customers. And then pay attention to your own web-based experiences. Gauge your reactions. 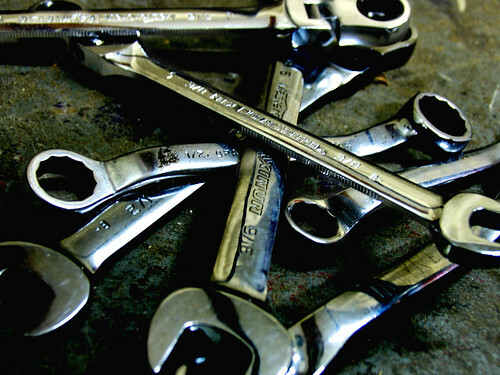 Chances are, if something irritates you, it will irritate your visitors, too. 1. Kill the flash. If you absolutely must, keep it to a minimum and don't hide any vital information within it. 2. Make your website searchable for the important content - who you are, where you are, and what you do. 3. Keywords count. Have them upfront, first line, first paragraph and within your content in a natural way. Make sure they are relevant to you, your content and your visitors. Simple, right? Would you add others? It's time for a practical Twitter primer. 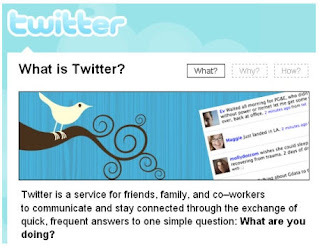 You see, four times in the past week, I've been asked "What is Twitter?" and then "How is that relevant to me?" Twitter is a free, micro-blogging platform. Micro because you have 140 characters to communicate a message of your choice. The primary audience for your 'tweets' [i.e., your micro-blogposts] consists of your followers; those are other folks with Twitter profiles or accounts who have decided to subscribe to your 'Twitterstream' or series of tweets. The secondary audience is the world, assuming your message appears in a Twitter-based search. Twitter definitely seems to be reaching mainstream. You'll hear it mentioned during network TV programs, and news programs, even Ellen DeGeneres shared that she had personally started twittering, although she hasn't been too active. My local ice rink has two twitter accounts: one with general rink information ["SkylandsInfo"] and the other ["SkylandsKings"] related to the Kings team. And, although you'll find plenty of inane tweets about what someone had for breakfast [in response to the Twitter question: What are you doing? ], I do suggest that you at least explore the platform so you experience for yourself what all the buzz is about. Go to http://Twitter.com and register. Create a profile; upload a photo of yourself [yes, you really need to include a photo] and give it a try. Your twitter handle with be something that starts with @ [mine is @cbwhittemore]. Twitter can be a valuable research tool. You need to try it out. Particularly as a business person, and most definitely as a practical marketer. Visit http://search.twitter.com and enter in some terms. Try keywords, brand names; enter your own twitter handle, with and without the @; what are the hot topics being discussed. See what appears. Interestingly, Twitter is poised to become more significant to search engines according to a recent AdAge article titled "What Social Media Means for Search." The author refers to Search 3.0 where "relevance is determined not just by what's on a page and what surrounds that page but how that data relate to your personal network." I discovered that the Smith College alumnae class of 1990 has a Twitter account. Some people are fantastic about capturing conference highlights via Twitter. Mack Colllier, David Polinchock and Steve Woodruff come to mind. To follow what happens at a conference you can't attend, try finding the 'hashtag' corresponding to the event [e.g., the MarketingProfs Digital Marketing World conference was coded #mpworld. Read Links of Note: Digital Marketing [Profs] Inspiration]. Then, enter the appropriate #code into Twitter Search and absorb the knowledge. At the recent South by Southwest conference #sxsw, Twitter was a critical communication and organizational platform. As with learning more about additional relevant blogs by exploring the blogrolls [i.e., the blogs listed on a blog's sidebar] of bloggers you respect, so with Twitter you can decide who to 'follow' by checking out the followers of various Twitter accounts, or clicking on the @name in a tweet of interest. Increasingly on Twitter, you will discover stories and blogposts worth reading based on people's tweets. You see, part of doing Twitter right is sharing with others. Sharing information or links or humor or wisdom. The share economy definitely exists. You'll notice that links are compressed into 'tinyurls' [visit Tiny Url and try it for yourself; then cut/paste into Twitter] to not hog up all 140 characters+. Many companies have become active on Twitter. Some of the most recognized are Dell, Zappos, Comcast, even MoMA. Twitter has been useful during natural disasters [e.g., the SoCal fires], the recent elections and the Mumbai terror attacks. As with many of these new marketing tools, it's worth your while to learn more about them, how they work, and how people share value with their followers. Set up your account, explore and dedicate 15 to 20 minutes per day experimenting. Investigate whether your customers might be participating. If so, can you engage with them and offer value? Look for thought leaders in your area[s] of interest and follow them. How do they use Twitter? What about your friends? Can you practice with them? And, then, let me know what you think. What worked. What didn't work. I've come across many articles and references to Twitter tools that I'll share with you in a separate post. For now, start experimenting! Have you heard of the DC Goodwill Fashion Blog? [added 2/12/10: note new DC Goodwill Fashionista Blog location] It's practical, engaging, effective and integrates marvelously into DC Goodwill's overall marketing strategy and greater mission. It's also a wonderful case of simple marketing in action. I first learned about the DC Goodwill Fashion Blog when I heard Diva Marketer Toby Bloomberg interview Fashionista Em Hall during the 2008 BlogHer Business conference in NYC when the blog was about 9 months old. 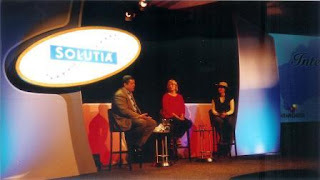 [Here's my summary of the session: BlogHer Business 2008: The Diva & The Fashionista.] Em Hall's passion for fashion and the DC Goodwill stores is powerful and contagious, as you can tell when you read the DC Goodwill Fashion Blog. She certainly thrilled and inspired and absolutely delighted me! Imagine how pleased I was to come across these two pieces about Em Hall and the DC Goodwill Fashion Blog! First, Ragan.com published the following interview with Em Hall [subscribers, please click on this link to Goodwill's Fashion Blog's a Success on YouTube] that Ragan describes as follows: "The DC Goodwill Fashionista, real name Em Hall who is the retail marketing manager for Goodwill in the greater DC area, sat down with Mark Ragan to discuss how Goodwill's blog has been a rampant success for them." Em strongly recommends adhering to a consistent schedule for posting to the blog. She does so three times per week, with Tuesday's post being the most popular [it's about the Goodwill Good Buy of the Week]. Next I came across an article by Eric Brown titled Put This In Your ROI Pipe And Smoke It [which has gone off into the ozone since I read it; luckily I found another version on Search Engine Marketing News/Put This In Your ROI Pipe And Smoke It]. I like the point that Eric's article makes about social media marketing: with SMM "you are connecting with your Customer in a much different fashion. You are creating a Relationship." So, what do you think of the DC Goodwill Fashion Blog? Do you agree that it represents an excellent example of Simple Marketing In Action? How might such an approach benefit your customer relationships? Here's one more article about the DC Goodwill's Fashion Blog - The Blogger Beat: DC Goodwill Fashionista from last summer. Simplicity originally uploaded by Thorsten Becker. Starbucks' Howard Schultz posted "Staying Real in an Instant" on Huffington Post. The story caught my attention for two reasons: it mentioned Starbucks and "simplifiers." You see 'simplifiers' are - according to John Quelch, HBS professor and marketing expert and author of "Too Much Stuff" from The Economist which formed the basis for The Next Marketing Challenge: Selling to 'Simplifiers' - people like me. He says [about me]: "She finds herself surrounded by too much stuff acquired. She is increasingly skeptical in the face of a financial meltdown that it was all worth the effort. Out will go luxury purchases, conspicuous consumption, and a trophy culture. Tomorrow's consumer will buy more ephemeral, less cluttering stuff: fleeting, but expensive, experiences, not heavy goods for the home." According to Schultz, who refers to John Quelch: "in a tough economy, consumers are redefining value. They are consuming less, and focusing more on seeking satisfying experiences that enhance their lives. He [Quelch] calls this growing segment "The Simplifiers." They want fewer material goods, and more quality-of-life experiences. At our core, we have the right stuff to appeal to these consumers, whether it's the respite from the world our stores provide or now with Starbucks VIA ready brew, quality coffee on-the-go." I admire Starbucks. They consistently deliver a perfect venti non-fat latte every time I order one. They have created a haven for me - truly a third place - particularly when I travel, and am in NYC for meetings in need of a place to chill. I love that my Dad enjoys lattes from Starbucks when I come visit and make the one block trek to their DC Starbucks for a fix. I love, too, that they relentlessly try to redefine the Starbucks experience and improve the value they deliver to remain relevant to Starbucks customers. In this article, Schultz addresses Starbucks' introduction of instant coffee. Now, for me, instant is not how I do coffee. My coffee is more about the steamed milk blending with the coffee than just coffee [the intensity of the sensory experience brings to mind a scene from Ally McBeal]. The closest I've gotten to 'instant' is via a Starbucks drive-thru or an airport Starbucks - both of which still offer me the 'third place' vibe. Nonetheless, I admire the company's willingness to explore unusual ways to connect with a distinct consumer zeitgeist "without forsaking their core values." Some of why I despise instant coffee is that it tastes despicably bad. Perhaps this Starbucks instant product - when mixed with steamed or very hot milk - might recreate the Starbucks in-store latte? I could definitely get into that! A guaranteed latte experience regardless of location? Wow! Quality and efficiency? A guaranteed practical experience? Yes, that definitely appeals to my sense of simplification. After all, I am a simplifier. I've written about the paradox of choice [most recently Refocus Product: Retail As Curator & Less But Better and last year Why Variety Matters For [Retail] Selection]. I am drowing in stuff. Everywhere I turn, there are too many choices to select from. Don't you yearn for relief from all of the stuff that surrounds you? Do you feel that we are drowning in possessions [see What Happens When Experience Economy Meets Recession Economy?]? I also value quality over quantity. Who wouldn't? Quality is more environmentally responsible, too. Perhaps challenging, but also an opportunity as "Too Much Stuff? Enter the 'Simplifier' states in Octopus: that this is the "great proving ground for truly authentic brands —those that deliver an honest and fair value, and an engaging, distinctive experience for the buyer." Something that Starbucks is attempting with its instant product. Something I believe we all strive for as we simplify, refocus and deliver outstanding value to customers. Kinnelon, NJ -- Christine B. Whittemore, former director, in-store innovation for Solutia Inc.’s Wear-Dated® carpet fiber, proudly announces the formation of Simple Marketing Now LLC, a marketing consultancy focused on bridging traditional marketing with social marketing to improve the customer experience and build brand. Simple Marketing Now focuses on basic and simple solutions to common marketing problems, in place of the complex and expensive solutions traditional marketing offers. “These simple social media based solutions reach the customers that matter in a new and more efficient way, with messages that are inherently of interest, authentic and valued,” says Whittemore, chief simplifier of Simple Marketing Now, who has implemented these solutions in her Wear-Dated roles, and understands their relevance for brand building in traditional businesses. 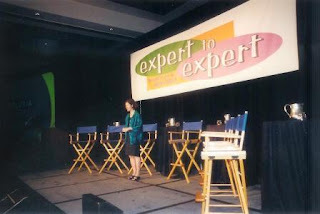 As a result of numerous presentations on the subject since 1998, through her marketing blog, Flooring The Consumer – launched in June 2006 and featured in the Advertising Age Power 150 Marketing Blogs – and in Floor Covering Weekly where she is a columnist, Whittemore has also established herself as an expert in marketing to women and the retail experience. She serves on Hanley-Wood’s Surfaces Education Advisory Council. Whittemore is the creative force behind the launch of the redesigned and social media friendly Wear-Dated website and companion Carpetology Blog, applying her knowledge of new and digital tools to the traditional carpet fiber category to improve the carpet consumer’s experience and strengthen the Wear-Dated brand online. For more information about Simple Marketing Now LLC, contact chief simplifier Whittemore at CBWhittemore [at] SimpleMarketingNow[dot]com or visit the Simple Marketing Now website and companion weblog & newsroom – Simple Marketing Blog. Simple Marketing Now LLC is a marketing communications consultancy that provides organizations with the right combination of traditional marketing and new and digital tools to improve the customer experience and build brand. For more information, visit http://SimpleMarketingNow.com. This post provides backup for the background information I share on Simple Marketing Now LLC in the About Us section: a history of presentations I've shared. You see, I regularly speak about the Retail Experience and Marketing To Women. Although I've started to address marketing with social media as a standalone topic, I consider it part of the consumer experience and introduced it as such in my 2009 Surfaces seminar. Here follow details of the formal presentations I have conducted. As new opportunities come up, I will add them to this post. 3/7/07: Flooring America/Flooring Canada Winter Convention Retail Sales Professional Education Day in Anaheim, CA: What Women Want... Women Get. Announced in Wear-Dated® Seminar Focuses on Engaging Women Consumers. Would you like to have Christine B. Whittemore speak at your event? Click on this link to contact her. 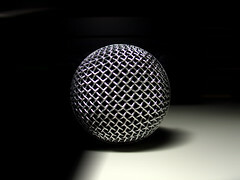 Image credit: Shure SM58 Microphone originally uploaded by Gudmundsson.